The jaguar is the largest cat in the Western hemisphere. Once revered as deities in Mayan and Aztec culture, jaguars possess immense grace and power. These agile hunters once lived throughout South and Central America and in the southern and central United States, but they lost habitat and were killed off to near extinction north of the U.S.-Mexico border. Since 2015 three wild jaguars have been observed roaming the southwestern United States, in southern Arizona. Thanks to work by the Center, all three — and any others that migrate north of Mexico or already exist there — are protected by the U.S. Endangered Species Act. Trump's border wall threatens to doom jaguars' recovery in the United States. Sign our Pledge of Resistance against Trump today. 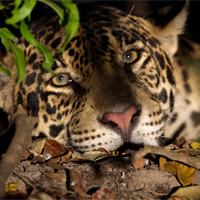 One of the most significant events in recent U.S. jaguar history was when El Jefe (Spanish for “The Boss”), was filmed in an exclusive video captured by Conservation CATalyst and the Center. We released the footage of this large male jaguar wandering the Santa Rita Mountains just outside Tucson in early 2016 (though photos of him had been released earlier). Another jaguar seen in Arizona — a smaller, younger male, named “Yo'oko Nashuareo" by students at Hiaki High School on the Pascua Yaqui Reservation 90 miles away — had his image caught on trail a camera in the Huachuca Mountains in December 2016. The third jaguar, named Sombra (Spanish for "shadow"), was photographed on a Bureau of Land Management trail camera in the Dos Cabezas Mountains, about 60 miles north of the U.S.-Mexico border. The Center released new footage of this jaguar on September 14, 2017. These jaguars' presence is to be celebrated and honored — but the U.S. jaguar population will never reestablish if migration from the small population in northern Mexico is blocked. And just days after President Trump’s inauguration, he announced his administration would complete a wall along the U.S.-Mexico border , which would also perpetuate human suffering, harm border communities and halt the cross-border movement of other imperiled wildlife such as ocelots and wolves. The last known wild U.S. jaguar before the three “new” jaguars appeared was called Macho B. He was tragically, wrongfully euthanized in March 2009 by the Arizona Game and Fish Department after being captured and fitted with a radio collar. The Center immediately called for an independent medical investigation, which revealed that Macho B’s death was at least partly due to malfeasance. We sued Arizona Game and Fish to prevent the killing of any more jaguars, and in January 2010, the Interior Department's inspector general released a report concluding that Macho B's capture had been intentional — although Game and Fish had no permit to capture jaguars. That year we also filed a notices of intent to sue the U.S. Department of Agriculture’s Wildlife Services over its use of traps, snares and poisons threatening jaguars and ocelots, and over the Fish and Wildlife Service's granting Arizona Game and Fish a permit allowing the incidental killing or injuring of jaguars with traps and snares. Jaguars were listed as endangered in the United States in 1997 in response to a Center campaign. After their listing, we three times sued the U.S. Fish and Wildlife Service to win a recovery plan and critical habitat designation, which the agency finally announced it would grant in 2010. The Center followed up by proposing the designation of more than 50 million acres of jaguar critical habitat in the Southwest. We also advocated for protection from government traps, snares and poisons, and opposed walling off the U.S.-Mexico border to defend jaguars’ access to the full extent of their range. In 2017 the Center joined with the Borderlands Project, the International League of Conservation Photographers and others in launching a story-map project that combines stunning photography with cutting-edge mapping and research to tell the story of the border wall and its harm. View our album of downloadable photos of the Arizona jaguars. Learn about how you can tell individual jaguars apart by their spots ("rosettes"). 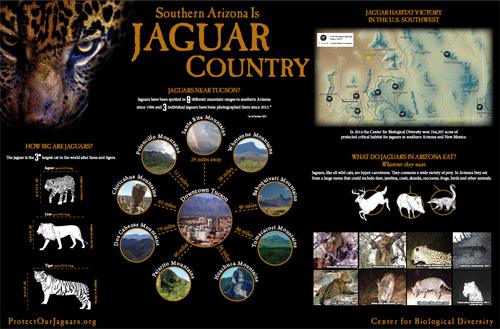 • 2013 Center video: "American Jaguar Field Research in Southern Arizona"
• 2012 Center video: "Tracking the American Jaguar"